Self-Absorbed Boomer: Dvořák's bird and train. Two weeks ago my wife and I attended a concert presented by the Brooklyn Chamber Music Society, featuring performances of string quartets by Haydn (C major, Op. 20, No. 2), Beethoven (F major, Op. 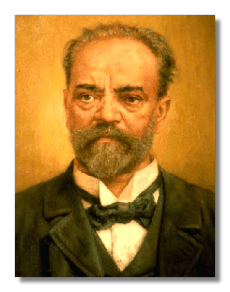 59, No, 1, "Razumovsky"), and Dvořák (image at left) (F major, Op. 96 "American"). The musicians were David McCarroll and Carmit Zori on violin, Dimitri Murrath on viola, and Julia Lichten on cello. Their performance of each quartet was superb. The clip above is by Seraphina, at the 2007 Bowdoin International Music Festival. It's from the YouTube library of Seraphina member Caeli Smith. This performance is by the Zemlinsky Quartet.